I love to have company. The idea of having a house full of people, laughing and conversing, makes my heart swell. Providing hospitality and sharing my kitchen, dining room, and living room to host a gathering is among my favorite things. It all starts with a knock on the door! There is great anticipation to see who has arrived. However, I have a new perspective as a result of a January term trip in 2016. A classmate and I were invited to a house in Austin, Texas, share a meal and conversation. The pastor, Pastor Joe, who himself is an immigrant from Central America, but currently serves a Latino congregation near Austin, Texas. prepared us for the home visit. We were given some details about the people which revealed the complexity of the living situation for this immigrant family. Three people lived in a duplex: one who is a dual citizen of El Salvador and the United States, their child, who is a natural-born citizen of the United States, and an ‘undocumented immigrant.’ I struggle using words to describe this individual who has arrived in the United States from Central America because of human-made boundaries (we call them borders). For this writing, I will use “undocumented immigrant” because it is the most fitting term. For this story, he will be referred to as Bill. The family of three, the pastor, my classmate, and I were gathered around the family’s dining room table to enjoy a meal. We prayed and dug in. The food was absolutely delicious and the conversation was deep! All was well with our souls and stomachs as we reached for seconds. Then, things all changed. There was a knock on the door. Time stood still. People froze. Silence rushed into the dining room. The atmosphere changed. The mood had taken an about face. There was another knock. The husband/father of the house, Bill, stood up and walked to the door. All eyes followed him. I can’t speak on behalf of the others around the table, but I immediately feared the worst, that ICE had arrived. We were going to see the ‘apprehension’ in front of our eye. This beautiful family was about to be torn apart! I was speechless and uncomfortable. I didn’t know how to respond. Being an Iowa native, I was familiar with the ICE raids in Postville in 2008 and was faintly familiar with the difficulties that immigrants face daily. Bill had talked about being employed in the United States without having ‘legal documents.’ Bosses treated him differently, often withholding pay or only paying a portion of what was owed. Work hours were long; there are no ‘safety precautions’ for people without documents. They can be replaced easily by the next person looking for a shot at a better life. The working conditions were often treacherous. But what really got to me was the fear of driving. Every trip in the car could be the last time in the United States. Every law enforcement officer poses a threat of possible deportation. Bill answered the door, and two gentlemen were outside waiting for him. The one on the right had a hat on with the logo of a local collegiate sports team. The other one was wearing a camouflage jacket. They said something to Bill that I couldn’t hear, and he walked outside. Seconds felt like hours. The silence was deafening. The tension was thick. A few seconds later, Bill returned–smiling! The men were repossession agents who were looking for someone and they had been given the wrong address. Bill made a joke about them taking his wife’s car, and we laughed. Bill sat back down and supper continued. Things were the same, kind of, for the rest of the evening. The thoughts and feelings I had during those brief moments of unknowingness led me to a reality outside of my own experience and into the life of the roughly 11 million ‘undocumented immigrants.’ Nothing is simple; there is no such thing as a quick trip to the store. Every element of public life is a heightened experience, with the thought of apprehension looming. I cannot fully understand what Bill was going through when he heard the knock on the door, but I am certain that it is much different than what I feel from unexpected knocks on my door. What I do know is I have been changed; I have seen my neighbor differently. Looking at this experience through Bill’s lens has changed my life. Every knock on the door now takes me back to a dining room with friends, new and old, when the rhythm of the world was out of sync for a few moments. Thanks be to God for opportunities of transformation. Members of the Wartburg Community took part in the Dubuque Community Prayer Event Sunday night October 18th. This was a significant and united witness of the Christian community in Dubuque for repentance in the face of racism and the need for racial reconciliation. The event included an extraordinarily diverse representation of the Christian community here in Dubuque. There were people from the great variety of Dubuque congregations: evangelical, Pentecostal, Reformed, Lutheran, Episcopal, Roman Catholic, Orthodox—white, black, Latino/a, and Marshallese. And the offerings of song and prayer, reading and proclamation were equally diverse. Thomas Schattauer, WTS Professor of Liturgics and Dean of the Chapel, offered this prayer at the event. you pour out your Spirit to empower and unify your people and renew the face of the earth. Gather us in the name of Jesus to be your people. Send us in your Spirit to renew this weary world with your forgiveness, life and salvation. in the promise of your reign of justice and peace, unite us in all our efforts for the common good. Most high and holy God, pour out upon us your one and unifying Spirit, and awaken in every part of your church a holy hunger and thirst for unity in you; through Jesus Christ, our Savior and Lord. This Spring when I learned that there would be a time set aside for students and their families during Presiding Bishop Eaton’s visit to Wartburg Seminary, I knew that I would bring my daughter along with me to the event. My husband, Shawn Brooks, and I started attending Wartburg Seminary when Nessa started first grade, and she has grown up a great deal during this time. When she met the Bishop she was almost 10-years-old and in fourth grade (we later learned Nessa shares her April 2nd birthday with Bishop Eaton). She has also had the opportunity to be a part of this diverse community, and is at home both in the residential area and in the academic buildings, or “the castle” as we call it in our house. 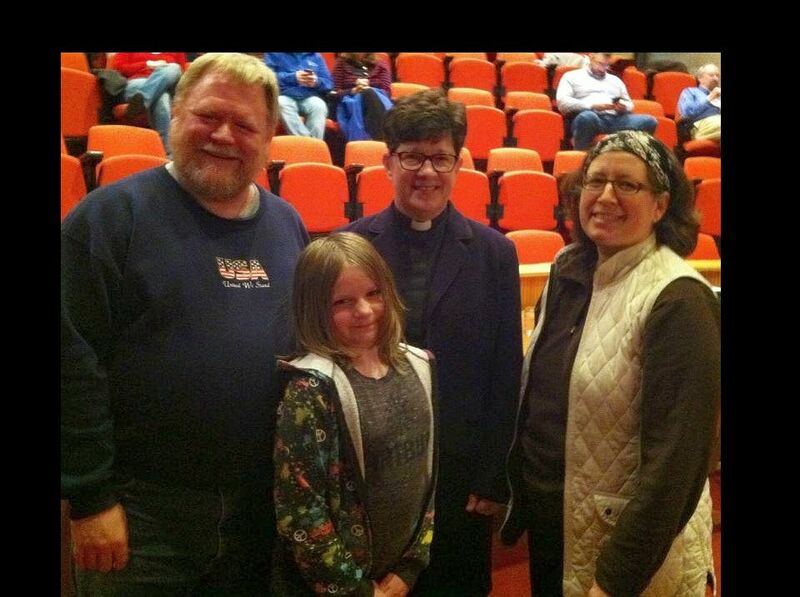 Presiding ELCA Bishop Elizabeth Eaton at Wartburg Seminary in March 2015 with final year students Tami Groth and Shawn Brooks and their daughter, Nessa. It is a commentary on our church that we are simultaneously preparing to celebrate the 20th anniversary of the decision of our churches to welcome women into ordained ministry and at the same time seeing the beginning of a newsletter which has a concern for the lack of welcome. More than l000 women are now part of the clergy roster of the ELCA and uncounted thousands participate in various forms of professional lay ministry in the church. Their ministries have been overwhelmingly positive. Their contribution is undeniable. Yet there are those who deny women the opportunity to serve—either in first calls or in succeeding calls. Together we need to address this. In the meantime, this newsletter will be one link. . . . I lament its necessity and I support its mission. Elizabeth (Beth) Leeper was installed as Assistant Professor of Church History November 10, 1989, bringing the number of women professors at Wartburg to four: Dr. Norma Cook Everist, Educational Ministry and Church Administration; Dr. Anne Marie Neuchterlein, Contextual Education and Pastor Care; Dr. Patricia (Patti) Beattie Jung, Social Ethics. Two women teach part-time in the Biblical division: May Persuad and Cindy Smith. The Evangelical Lutheran Church of Zimbabwe is planning to ordain its first two women pastors when they complete seminary this year. In Tanzania the faculty of Makumira Lutheran Seminary is urging the church to ordain women. Rebecca Grothe, a 1981 MA graduate of Wartburg, was recently Wartburg’s first “Associate in Ministry in Residence,” spending a week on campus, addressing classes, preaching in chapel and speaking informally with students. Becky is Senior Editor for Leadership Education at Augsburg Fortress in Minneapolis. She previously served as Director of Christian Education at Bethel Lutheran in St. Clair Shores, Michigan, and at Zion Lutheran in Luckey, Ohio. You challenge growth within me. All that I can be. How do we begin to address injustices that are so tightly woven into the fabric of our lives and nation? That is the question that looms in the minds of students in the American Genocide class at Wartburg Seminary as we discuss the atrocities committed against the indigenous peoples of the Americas. We are examining the stark, disturbing, realities that European contact brought to the “New World.” We are finding a different view of history than many of us learned earlier in our schooling. We are discovering that much of our national “history” does not give consideration, much less voice, to the millions of people killed after Columbus landed in America. The idea that we celebrate these national myths on the second Monday in October is ludicrous. Lest we try to separate ourselves from the violence committed against American Indians in the past, the product of that violence remains in many forms of systemic racism that continues to oppress, ignore, and disregard American Indian peoples. So, once again, “How do we begin to address injustices that are so tightly woven into the fabric of our lives and nation?” One of the students in the class shared a news article about some cities and institutions that had decided to observe Indigenous Peoples Day rather than Columbus Day. We talked about what we might do and as a result of that discussion we drafted these 9.5 Theses in hopes of raising awareness and opening a space for honest conversation to break the silence that surrounds past as well as current events. 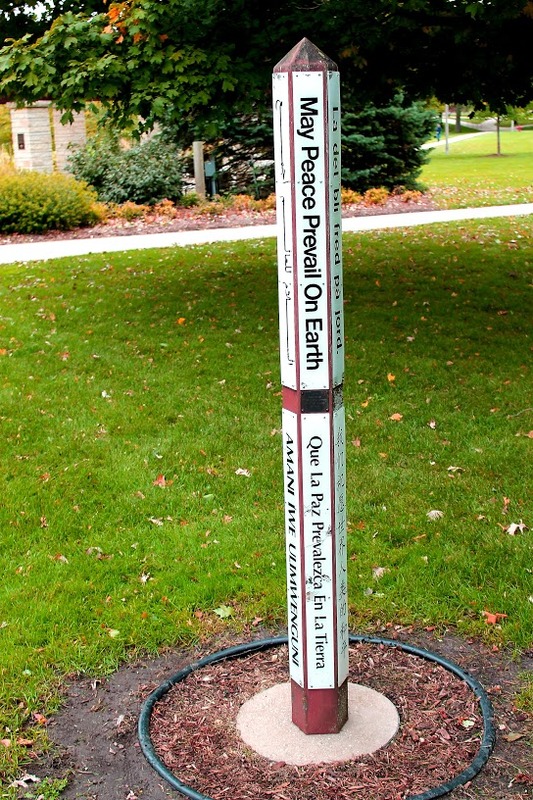 Today is Indigenous Peoples Day: 9.5 Theses! Because the arrival of Columbus marked the beginning of an indiscriminate genocidal campaign against Indigenous Peoples, we resolve that the WTS community recognize the 2nd Monday of October as Indigenous Peoples Day. When Jesus said “repent” he meant that believers should live a whole life of repenting. We are called upon to repent of the crimes against humanity committed in the name of Christ against the indigenous people of this continent, beginning with Columbus. We call attention to the fact that inaccurate and false reporting of historical events creates fertile ground for divisiveness, stereotypes, racism, segregation, fear, and hate. We call attention to the fact that egregious human rights violations were committed against Indigenous Peoples in the past through dehumanization and countless acts of violence. We call attention to the fact that human rights violations continue to this very day through systemic means that allow the continued dehumanization of Indigenous Peoples. We call for the concerted effort to form relationships and partnerships with Indigenous Peoples, learning from them, how we might begin to have a greater understanding of the impact our ancestors’ actions had on them, and their cultures. We call for standing in solidarity with Indigenous Peoples in their struggle against oppression. We call for re-examination of beliefs and attitudes, both personally and communally, that actively prevent Indigenous Peoples from equal access to education, health care, and opportunities for self-determination. We call for the purposeful study of the past, to ascertain a more truthful understanding of the atrocities that prevent reconciliation with our indigenous brothers and sisters. We call for a truth and reconciliation process with the Indigenous People of this continent: to repudiate the doctrine of discovery, to confront the history of genocide against them, repent of past crimes committed against them, and to attend to their voices and wisdom in discerning a more just future. 9.5. How will you observe the 2nd Monday in October?